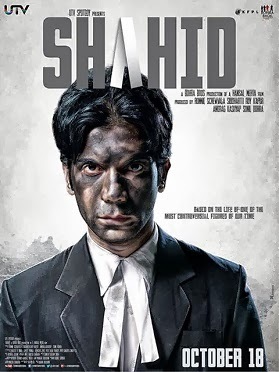 Easily one of the strongest films you’ll see this year, it’s based on the true story of controversial human rights lawyer Shahid Azmi, who was gunned down in cold blood in 2010, presumably for defending a 26/11 accused, who, as it turns out, was acquitted last year. The film itself is brave and unflinching, and oozes the kind of sincerity that you long for in most Hindi films. I’m going with four out of five for Hansal Mehta’s ‘Shahid’. Well made, and gripping till the very end. While the story of Shahid Azmi makes for an interesting read/conversation, Hansal Mehta makes sure he packages the film with abundant drama [the courtroom sequences are spellbinding] in this less-than-2-hour film. But, at heart, SHAHID remains a disturbing film, with Hansal preparing the viewer at the very outset as Shahid witnesses a gruesome act. The events thereafter — Shahid’s training in a terrorist camp and on return, getting picked up by cops and imprisoned amidst hardened criminals — are chapters that are enlightening. On the whole, SHAHID is a brave film. Its gripping story, exceptional execution and bravura performances continue to reverberate much after the screening is over. Strongly recommended! Mehta’s telling, especially in the first half, is laborious and I found myself getting restless. You might too. But thankfully Shahid gains momentum and urgency in the second half. Ultimately however, Shahid is Raj Kumar’s triumph. His Shahid has strength, anguish and a controlled anger but also real charm. His smile lights up the frame. See Shahid for him. I’m going with three and a half stars. Shahid is an important story to tell. DirectorHansal Mehta has done a remarkable job chronicling the true tale of slain advocate Shahid Azmi and bringing it to the mainstream. It goes well beyond being a fierce biopic, a purposeful indie, or just a riveting drama that’s impossible to dislike. Reflecting the intention of its protagonist, Shahid, sharing a hallmark with all significant films, ultimately makes a statement. On the whole, Shahid is a well-made and well-enacted film but it has very limited appeal. It is basically for the high-gentry audience who frequent high-end multiplexes in the big cities only. It will have to depend almost totally on mouth publicity to make a mark. Its low budget is a big point in its favour. Even if you’re acquitted, the right to live a life in fairness and dignity is permanently adjourned. Case closed! The story of ‘Shahid’ (fact remixed with fiction) confronts us with hard-hitting questions on religious fundamentalism, flawed legal investigations, and injustices suffered by the underdogs. It warrants applause. And an unadulterated encore. Catch it if real cinema is what you crave.Note: You might not like this film if gritty, real-life dramas are not your idea of entertaining cinema. Mehta’s Shahid is not an in your face film. It is a subtle, thought-provoking and gutsy story of a person who believed in the power of truth and justice yet knew that the path he had taken was strewn with risks, indifference and ignominy. Shahid, after all, is the story of every Indian citizen who gets overwhelmed by their own circumstances, go astray and yet come back to do what their conscience asks them to do.Don’t miss the film. The movies is a story of lawyer Shahid Azmi who was shot at his office in Mumbai in 2010. He was a criminal lawyer who was murdered for defending a 26/11 accused.Clearly Hansal Mehta has put in his best and has managed to touch the right chord with the viewer. This is his best work so far!Shahid will take you by surprise. Book your tickets now because a film like this is rare! It’s a must watch! I would strongly recommend you to watch Hansal Mehta’s Shahid. Based on the controversial life of human rights lawyer Shahid Azmi, Mehta’s tale is taut and convincingly told. Showcasing the grim side of police machinery, the film shows how the police doesn’t shirk before victimizing the minority on the basis of mere suspicion. Raising potent questions about the prevalent attitudes, mores and laws in our country, especially TADA, Shahid is a quintessential humane story sketched with utter simplicity. It gently draws your attention beyond the media reported truths about the terrorist attacks which brand the rumored accomplices as terrorists. They are often just as victimized as the rest out the crowd, perhaps a little more bruised, a little more stigmatized!